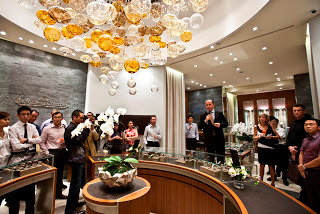 On February 17 – literally a month from the opening of SIHH in January – Jaeger-LeCoultre showed the bulk of its 2011 collection in Singapore, the “SIHH Around the World 2011” tour. JLC was the first brand to do so, and the following months will see other brands doing the same. Not too long ago, a wait to the second or third quarter to see any new product was de rigeur. Collectors would patiently and quietly wait as the months passed, occasionally venting their desires on some internet forum. But now times have changed. Brands are doing this because they want to lock in the consumers’ watch budget. Once you allocate some dollars to a JLC in February, those dollars are not longer available for another watch in June or July. And buyers are demanding to see the watches in the metal sooner due to the internet. With photos available literally as soon as the fairs open, buyers quickly demand gratification. This escalation will continue. Novelties will be shown earlier and earlier, constrained only by logistics – the ability to get the watches to a particular locale. In fact, I would not be surprised if eventually events in local markets took place simultaneously with SIHH. I imagine there are brands that will not be swept up in this, either because their watches sell so well that they don’t care, or they are too small and unable to manage the logistics. But for the broader market, especially at the vital and ferociously competitive mid-level luxury segment, there can be no surrender.